Tuesday April 9th 1895 It was a very pleasant day. I did some work in the yard and Will helped me fix some coops to set hens in the afternoon. I took of a hen today and put 24 chickens with her. I sewed in the evening. Wednesday April 10th 1895 I was busy with the work most of the forenoon. After dinner we went in town. I took butter and eggs to the store. I met Ott and Fanny. They want Nell brought back. We went over home a little while. I did my evening work and read a little. Thursday April 11th 1895 I dressed chicken and did the washing with Olivers help. Will took Elmers plow home and after an early dinner We took Nell in home and led a horse to drive back. Will went on over to Marys. We started home a little after four oclock I did my evening work and read some. 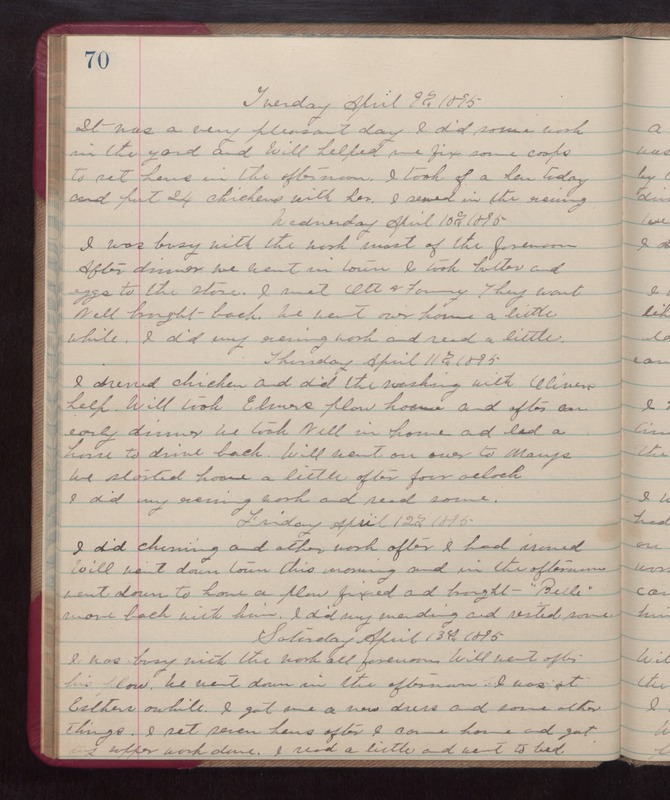 Friday April 12th 1895 I did churning and other work after I had ironed. Will went down town this morning and in the afternoon went down to have a plow fixed and brought "Belle" mare back with him. I did my mending and rested some. Saturday April 13th 1895 I was busy with the work all forenoon. Will went after his plow. We went down in the afternoon. I was at Esthers awhile. I got me a new dress and some other things. I set seven hens after I come home and got my supper work done. I read a little and went to bed.